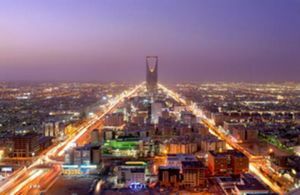 Riyadh (الرياض‎ ar-Riyāḍ) is the capital of Saudi Arabia, located slightly east of the center of the country in the heart of the Tuwaig escarpment. Riyadh is considered the most straight-laced of the Kingdom's big three cities. With most forms of entertainment banned, few sights of interest and a brutal climate, Riyadh is mostly a business destination. Although everyone adheres to the dress code thawb for men and abaya for women, you might come across many Saudis in Westernized clothing. English is spoken by most Saudis (most in Riyadh speak it well) as well as most foreigners. Until the 16th century, Riyadh (or, more accurately, Ar-Riyadh) was known by the name Hajr, an important city of central Arabia dating from at least the 3rd century AD (and probably older). In the Middle Ages, Hajr served as the capital of the province of Al-Yamamah, whose viceroys presided over most of central and eastern Arabia. With the decline in the fortunes and wealth of central Arabia after the 10th century, the name Al-Yamama gradually disappeared, and Hajr became subsumed under the name "Najd," which had previously referred only to areas lying further west. The name Hajr also gave way to the name "Ar-Riyadh" (meaning "the gardens"), as the old city broke into several towns and farming estates. Only a hundred years ago, Riyadh was a dusty walled town of under 20,000 people surrounded by palm groves, fertile wadis, and a number of small villages. Riyadh (or, rather, the neighboring hamlet of Diriyah) is the ancestral home of the al-Sauds. Driven out by the Rashids in 1891, King Abdulaziz ibn Saud famously raided and recaptured the city in 1902. The city was made the capital of Saudi Arabia when the country was born in 1932, and has grown explosively ever since then — as of 2008, the city is estimated to have some 5,000,000 inhabitants, and is still growing fast. Located in the middle of the country, Riyadh suffers from the worst of Saudi Arabia's climatic extremes. Summer temperatures regularly exceed 45°C, while winter temperatures can fall to just above zero. It's bone dry throughout the year, and when the wind blows the city is often covered in a haze of sand. However, while summers are blazing hot, they are not humid, which goes some way to alleviate the pain. Summer evenings are generally tolerable and one even encounters the occasional cool breeze, especially on the outskirts of town. There are three terminals in use, with Terminal 1 used by international carriers, Terminal 2 for Saudi Arabian Airlines international flights, and Terminal 3 for all domestic flights. The terminals are right next to each other and are connected at the arrivals level, so transfers involve lugging your stuff for a few hundred meters or, more sensibly, hiring a porter to do the job. It is also possible to walk between terminals 1 and 2 once air-side. Aside from Saudia, direct connections from outside the Gulf and South Asia are surprisingly limited, but options includes Lufthansa from Frankfurt and Munich, British Airways and bmi (becomes BA only from October 2012) from London-Heathrow, Air France/Saudi (code and operator share) from Paris, Turkish Airlines from Istanbul-Ataturk and Cathay Pacific from Hong Kong. The most international popular route, though, is via Dubai, from where there are at least half a dozen flights daily. Domestically, Riyadh is one of the main hubs and there are flights to every corner of the Kingdom, including near-hourly departures to Jeddah. Unlike Jeddah, immigration and customs clearance at Riyadh is usually fairly straightforward (unless the computer system is down). Beware that standing in the wrong line for immigration may work out fine for you, or you may be catapulted back to the end of a different line when you hit the front position (making all that waiting worthless). The row for "Exit / Entry Visas" is only for resident expats that have left the country temporarily, to visit family for example; although this is often ignored. You'll probably be accosted by touts as soon as you exit customs, but just ignore them and head to the taxi ranks outside. While the official taxis are supposed to use a zone-based flat fare system, with most of central Riyadh in the SR 45 or 55 zones, the list of zones is available only in Arabic. A metered fare to the city should cost around SR 70-90, but more often than not the driver will just ask for a flat fare, which may even work out a little cheaper. If you've let yourself be scored by one of the private drivers (that are not only inside the terminal building but also outside), make sure the price you agreed on is truly agreed on, or your driver may tell you that he didn't agree to 80 Rial but rather 180, meaning you'll settle on 120. The better bet is taking an official taxi! A good alternative - if offered - is to take a hotel limousine. These are often not much more expensive than the taxi trip, but mostly high-quality, comfortable cars rather than run-down, creaky old clunkers with worn-through seats. Allow plenty of time when traveling from this airport. Only travelling passengers will be able to proceed more than a few meters beyond the airport entrance. There are 2 sets of check in counters available in terminal one - left and right. In general these counters open 2 hours before flight time as many are shared with other airlines. Each set of counters has 2 x-ray machines where you must first scan all your luggage (hold and carry-on) before you get to the check-in counters; and only travelling passengers are allowed through this area and the lines can be quite long. Once you have checked in and obtained boarding documents, you must then pass through passport control and additional x-ray machines. The length of time for this part of departure is difficult to predict given the number of flights leaving in proximity to one another. There is a "Family Lounge" area upstairs on the left from the Terminal 1 check-in area before passing through passport control (as of 18 Sept 2013 - this lounge is closed and under renovation). Riyadh's train station is approximately in the middle of the city, with seven trains daily to Dammam (six stopping at Al-Hofuf and Al-Hasa and one nonstop) in each direction. Try to show up 30 minutes early, as you'll need to pass through security before boarding. There is a brand new train station located on the northern outskirts of the city (near the airport) with daily trains to Ha'il via Majma'ah and Qassim. The Central Bus Terminal (tel. +966-1-2647858) is inconveniently located in the Aziziyah district some 17 km south of the city center; expect to pay at least SR30 for a taxi to get there. Buses from Dammam take a tolerable 4.5 hours, while it's a punishing 10-12 hour haul to Jeddah or Mecca with several stops on the way. Riyadh is very much a car-oriented city, and public transportation in Riyadh is badly underdeveloped. There are street addresses everywhere in Riyadh, but normally mail is delivered to post office boxes. Getting around requires knowing landmarks near the place where you want to go. If you are travelling by your own car then it is wise to carry a GPS. Plan your route before start of journey. Although many streets, roads and landmarks are marked in both Arabic & English yet there are few important major streets, roads and exits that are still marked in Arabic only. Riyadh is building a metro system, which will be operational in 2019. Most visitors rely on white taxis, which are abundant in the city centre but can be harder to find on the outskirts or at night. Drivers will usually use the meter without asking if you do not propose a fixed price, and with a starting fare of SR 5 and the meter ticking up SR 1.60/km after the first kilometer, most metered trips within the city cost under SR 30. However, locals usually prefer to negotiate fares in advance, and this can often be cheaper than using the meter: short hops start at SR 10, a longer journey might be SR 15. Flat-fare minibuses (SR 3) rumble the streets of Riyadh, but these are mostly used by laborers. They are quite difficult for the casual visitor to use: there are no posted stops, and routes are usually written only in Arabic. Most routes converge on al-Bathaa, and the adventurous visitor can try his luck on route 9, which runs from al-Bathaa up Olaya Road. The best option for traveling in Riyadh is your own car, ideally driven by somebody else used to the conditions, but many expats take the plunge and drive themselves. The traffic in Riyadh is, by Saudi standards, fairly sane: ubiquitous raised bumps on lane markers keep cars traveling more or less in straight line, and radar-equipped cops on the major highways zap the craziest of speeders. Still, the local driving style can charitably be described as "aggressive", with swerving from the leftmost lane to the exit ramp on a four-lane highway being par for course, and central Riyadh jams up almost daily during rush hour. Since June 24/2018, women are allowed to drive. If you are visiting the Kingdon you can use your international driver license. Sightseeing in Riyadh is a frustrating exercise in careful timing: not only are most sites closed on weekends (Fri/Sat) and during prayer hours, but visiting hours are segregated between men and families. The one saving grace is that many sites stay open until 9 PM. A dry and sharply defined riverbed (wadi) begins about 40 km north of Riyadh and runs in a north-south direction for over 120 km, cutting through the western edge of the city, known as Wadi Hanifah. Wadi Hanifah was once the lifeblood of the Riyadh area, rich in groundwater, filled with palm groves and farms and dotted with a string of small towns and villages throughout history. In recent decades, the Wadi has been used as a large dumping ground for wastewater, sewage, and industrial waste, but a recent ambitious rehabilitation project has just been completed. An 80 km stretch running through western Riyadh is now essentially an 80-km desert park, though many parts of the Wadi floor are occupied by private estates and farms with high walls. The Wadi has several entry points, but perhaps the easiest route is by taking King Abdullah Road west past the university and into the town of Arqah. Eventually, you will reach a large round-about. Take the exit heading downwards into the Wadi. Follow the road even as it winds and weaves its way through the Wadi (do not be tempted to turn onto any side streets). Eventually, you will reach a police checkpoint, to the left of which is an an entry point to the Wadi floor. A narrow paved road runs along the Wadi floor. Heading southwards, you will eventually find designated picnic and barbecue spots facing the Wadi's cliff-like walls. Located on a hill overlooking Wadi Hanifa, Al-Dir'iyyah, on the northwestern outskirts of Riyadh, is the ancestral home of the Saudi royal family and served as the Saudi capital until 1818. The ruins of the old city are currently being restored and renovated and are thus closed off for tourists, but the surrounding area can still be worth the visit in the meantime. Although few Saudis play golf, there are surprisingly good golf courses around. The best one is the 18-holes course in Dirab Golf & Contry club a good 30 minutes drive west of Riyadh. Nice layout with green and inviting grass, and the last 9 holes are even floodlit. They offer tennis, swimming and horse-back riding as well. There's also a quite nice 9-holes short range course connected to the Hotel Intercontinental almost in the dead centre of the city. Nice but short - also floodlit. If you travel about 20 minutes to the north-east you will find a not so nice desert course with browns instead of greens (the putting area consist of sand/oil mixture instead of grass). Head west down the Makkah Road for 30 minutes, and you'll reach the edge of the Tuwaig Escarpment. As you make the 200 meter sharp drop from the Tuwaig escarpment to Najd-proper, you will get a good feel of the desert with dunes and buttresses. Heading northeast of the airport to the Thumama sand dunes, one can engage in "dune bashing" in 4x4 SUV's or in rented ATV's. Saudi Arabia is football-mad country, and big matches at the King Fahad Stadium can attract crowds of 50-70 thousand, creating an electric atmosphere. However, note that football stadiums are off limits to women. For people who are moving to Riyadh/ new residents, the city has a good number of fairly well-equipped modern Gym for men, women though have limited options, fitness centres for women are mainly in big hospitals (e.g. Hammadi hospital and King Faisal specialist hospital). Eating out is one of the pleasures of Riyadh — there's a pretty good selection of restaurants for various cuisines, ranging from cheap and hearty to fancy and expensive. The famous Saudi "Kabssa" is worth trying, this spiced up rice, served with chicken or lamb is the main and most favourable dish/meal in the kingdom. Your best bet for cheap, filling meals are Riyadh's countless small Pakistani/Indian restaurants, which can fill you up with curry and rice for about SR 6-11. Fairuz Garden: Excellent Lebanese restaurant with outdoor seating. Driving north on King Fahd road, just a few blocks from Kindgom Tower, you will see it on your right. The setting is lovely and food is delicious. With alcohol, cinema and nightclubs all banned, due to Saudi Arabia being an Islamic country, Riyadh's nightlife is limited. Even that mainstay of the Arab street, shisha (water pipe) cafes, are banned from the center of town — although they can be found just outside city limits at Thumamah St, about 10km away from the center off the road to the airport. Ask a local (or any taxi driver) for his favorite. One place you can go for coffee is in coffee shops, which can be found in abundance throughout the city, particularly on Tahlia St (officially Prince Mohammed Bin Abdul Aziz St) in Olaya. For the foreign workers (the expats) the social life can be quite rich however. There are always a good party going on in the embassy area or in one of the compounds. In case you run into it, especially within expat communities, Saudi champagne, a non-alcoholic drink, typically a mix of Sprite and apple cider is available. Most of Riyadh's budget hotel, apartment, and motel accommodations is in al-Batha although if you rent a room from an expatriate and share the utility costs with them, you may be able to haggle your way down to paying 810 SAR a month. An alternative cheap living if the cheap co-rent is unavailable is a budget hotel. It is advised that you should check the room condition and proper functioning of all equipment (e.g. TAP/FLUSH/TV/Power Outlets etc. )in budget hotel prior to check in. Al Jazeera Hotel, Al Bathaa Street, +966 1 2863863. Good value hotel on main street, offering singles/doubles from SR60/120. Behind this hotel there is multistory building (Nesto Hypermarket) for shopping and car parking SR5/24Hrs. (Note: Pay Parking Fee in advance & get receipt for desired number of days otherwise there may be fine of SR50. Keep the Parking fee receipt safe untill last day as you need to show it everytime you exit from parking. You can enter and exit parking as many times you wish within the validity of receipt). Cairo Hotel, Al Batha between the flyover bridge and old gold market from SR 70 - SR 100. Riyadh is more conservative than Jeddah or the Eastern Province. The mutaween (religious police) are numerous in Riyadh and not to be messed with. Women must cover themselves with an abaya (available in shops everywhere in Riyadh) and it's advisable to carry a headscarf as well. Read, understand and follow the guidelines in the Saudi Arabia article to stay out of trouble. WARNING: Homosexuality is illegal, and punishments range from imprisonment and flogging to the death penalty for the first offense. For the second offense, the penalty is an automatic death sentence. Homosexuals have been beheaded for “ugly acts of homosexuality”. In 2002-2004, Riyadh was the site of terrorist attacks on westerners. In response, Saudi security forces cracked down brutally, and there have been no terrorist attacks in Riyadh since 2004. Security remains very tight though, particularly at housing compounds for foreigners, and police and army units, often heavily armed, are a common sight in the city. But Riyadh is now much safer than 11 years ago. You will probably not be bothered. The people are generally helpful and will be interested in helping you. Although Riyadh has one of the lowest crime rates in world, standard precautions should be taken. The most significant danger to you is driving. Most drivers originate from areas in developing countries and the Middle East which lack traffic laws, driving schools, or even roads for that matter. It's a 'driving culture' where seat belts, mirrors, lane stripes, turn signals and speed limits are ignored. A four-lane highway can easily transform into a seven-lane 'racetrack'. Don't be shy with your horn. Socializing with the family-oriented Saudis is difficult, so getting in touch with the local expat community will be an easier social life. Try to get out of Riyadh on the weekends, when virtually everything is closed or inaccessible to single males. Respect Islam and abide by the country's strict Islamic laws. There are cases of Westerners arrested, deported and receiving corporal and capital punishment for showing signs of disrespect. Expect no leniency if you are Muslim, South Asian or Southeast Asian. Riyadh is one of the strictest cities in Saudi Arabia.